On the bars poured coal and put in front of a mountain of heated blowtorch (Fig. 2). The lamp flame ignite the coal and maintain its intense burning in the future. Just need to find the most effective line of flame, as obtaining a high temperature depends largely on the blast. 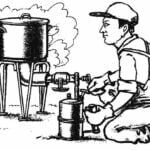 For reasons of safety and for protection of the tank blowtorch from overheating, it is expedient to isolate her from the heat horn the screen of non-combustible material. 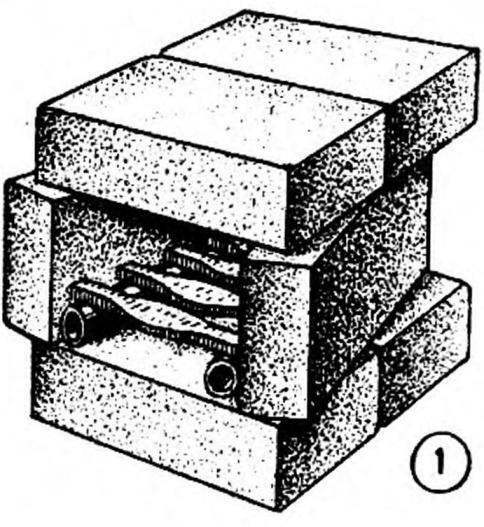 Billet to forging, bury in live coals, where they are kept until until heated to a light orange color, which corresponds to a temperature of approximately 1000 — 1100°. Long withstand the workpiece is not necessary, as they have dramatically deteriorate the mechanical properties of the metal becomes brittle. 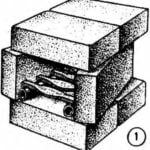 Forge usually a hammer mass of 0.5 — 1 kg. And be sure to use protective glasses, so hot slag does not fall into the eyes. The anvil can be any solid metal disc: sledgehammer, chip rail and tan on. Opportunities and techniques of hand forging is very diverse. 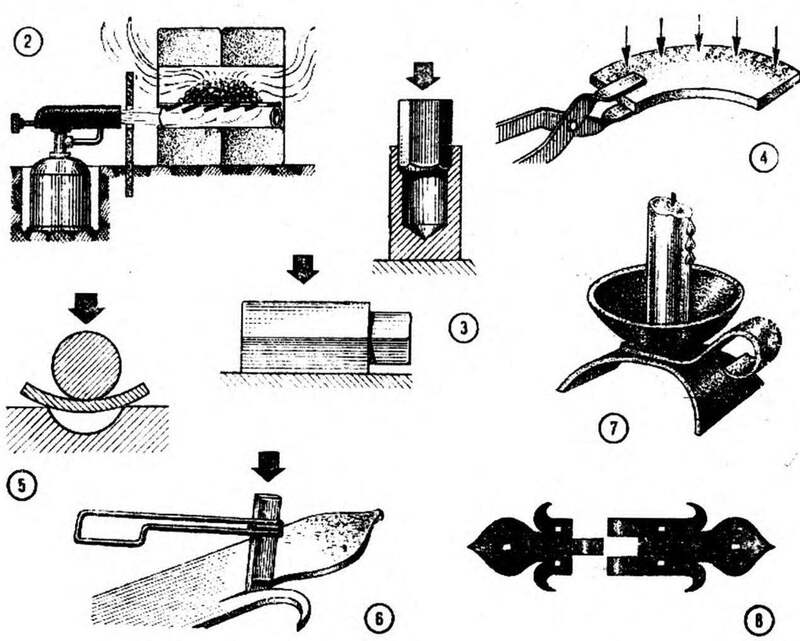 To obtain, for example, semicircular a chisel, a hot plate put on a special stream in the anvil top is applied with a steel bar and hit it to bend the workpiece (Fig. 3). If you want to dig Crescent-shaped strip, then strike follows one edge of the strip, as shown in figure 4. And that itself will be curved in the opposite direction. The head of the socket wrench is formed, the driving piece hexagonal hole in the heated billets (Fig. 5). Then must be forged outer faces. Chopped the metal in a hot condition with an ordinary chisel, attached to a handle of thick wire (Fig. 6). Using forge and carry out the so-called forge welding. If, for example, it is necessary to connect the two records overlap (as before welded rims, the carts), then it is heated in a forge to white heat (1300 — 1350° C), then remove the scale, strewing brown and brushing it with a wire brush, and putting plates on one another, prokovyvayut until then, until they are welded. Just remember that easy to weld only mild steel. Steel parts, in addition to welding, it is also possible to solder. To do this, they bind with iron wire, cover flux (borax) and heated in a furnace to an orange heat (900°). Then, in the soldering make a solder brass PMC-42, PMTS-50 or just pieces of brass. Pine ends when sing evenly spread across the seam. During the time the forge to produce household items: all grates, fire-irons, decorative hinges for doors and gates, candlesticks — they will give your home a special touch. To make wrought iron candle holder (Fig. 7). cut out a circle of metal, heat it in the forge, then the anvil with hammer blows from the billet center to the edge of the spiral (the farther from the center, the punches should be weaker) clench billet tan, so she took the form of a bowl. Stand — out cut metal strip. The edges are flattened — they are wide and thin. The strip is partially curved. To give a more strict geometric forms of her tinkering on metal logs of appropriate diameter. The handle also bends at the logs. The Cup, the handle I drilled the stand and is connected by rivets. Door hinges (Fig. 8) do the following. The workpiece mark out the edge of the petals and loops and a hacksaw just cut out of the loop. The rest of the contour drawing madrobot chisel to on a hot late harvesting were noticeable lines. The workpiece is heated and chisel to cut down copiaza and petals, which themselves are wrapped. Loops form a hammer.kom on a metal rod of appropriate diameter. Insert axis and clench it from both sides. Forged product to impart a black color of crows. They cleaned from the plate scale, and then heated to about 300° and RUB trapnell dampened with machine oil. Small the whole things dipped in butter and then rubbed with cloth. Much to overheat the metal is not recommended, as it can form a new layer of scale, which will adversely affect coating quality. Even stricter, the need to treat heat treatment instruments, because the accuracy of the observance of its modes depends on their quality. It is important therefore to know the basic types of heat treatment — hardening, annealing and tempering. Hardening increases the hardness and strength of steels. The metal is heated to 750 — 900° and lowered into the coolant: for carbon steels is, as a rule, water (you can add up to 10% salt, which increases its hardening ability), doped — liquid engine oil. Annealing is used to soften steel for ease of machining. The workpiece is heated in a forge for hardening, but gradually cooled with mountain or bury them in hot sand, where they slowly cool down. Vacation softens the effect of hardening and increases the viscosity of steel. There are high and low vacation. Get high by heating up to 300 — 700°. The higher the vacation, the lower the hardness of the steel and the higher its ductility. Get low vacation when heated to 200 — 300= followed by cooling in air. As a result, the fragility decreases, l the hardness is almost unchanged. This from the” start-up is used mainly for heat treatment of the cutting tool. The heating temperature at a low vacation is determined by color of a tint on the surface of the metal, purified from dross. This is how temperatures (in degrees) correspond to these colors: light yellow 220 yellow — 230, dark yellow — 240, brown — 255 brown-red — 265, violet — 285, dark blue — 300, light blue — 325, gray — 330.